Leading Manufacturer of thread protector from Kolkata. A thread protector is used to protect the threads of a pipe during transportations and storage. Thread protectors are generally manufactured from plastic or steel and can be applied to the pipe manually or automatically (by machine). Thread protectors are used frequently in the oil and gas industry to protect pipes during transportation to the oil and gas fields. 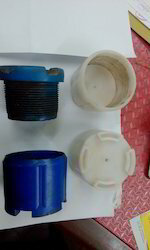 Metal thread protectors can be cleaned and re-used, while plastic thread protectors are often collected and either re-used or recycled. 2.7/8" EUE PIN & 2.7/8" EUE BOX.......READY STOCK. Looking for Thread Protector ?